Wow does this game look good. The models just look fantastic with the amount of detail in them. The scenery is good too, and I didn't see any graphical issues. No pop-in, no muddy textures and no frame rate issues. There are nice explosion effects, and the electricity on Raiden's sword looks cool. The cinematics look even better. They are a step up from the game graphics, but it's not a very big step. I'm actually really impressed with the look of this game. The only odd thing is when viewing the codec screens. Yes, they are supposed to harken back to the ones in Metal Gear Solid, but it's kind of funny that this society can build super powered cyborgs and transforming tanks, but have codec video that looks like it was from the 90s. The voices sound good. To me, the accents sound convincing and all voice actors involved did a good job. All of the lines are spoken, which is to be expected from the very cinematic direction the Metal Gear games have taken. The music is pretty good too, albeit a little strange when in the middle of combat it starts playing some "angry alternative" music or something (I probably sound old now). Not too jarring, and it did fit the game, but you knew you were in for a fight when it came on. If you played the demo or saw any of the various gameplay videos, you know that it's primarily an action game. Kind of strange that it isn't a "tactical espionage action" game, but I was surprised that there is stealth in the game. There are times when you can sneak by enemies and avoid confrontation, Solid Snake style. I enjoy sneaking around, but I was always sure to get a stealth kill on the enemies, since it's so fun. You don't get many hiding options if caught, so you either fight or hope you can run. 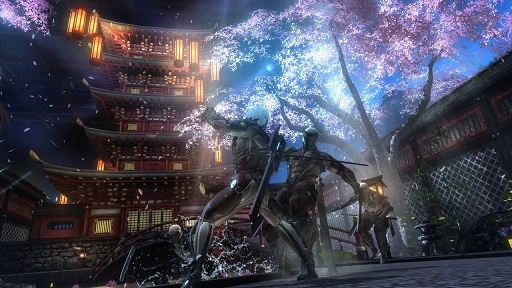 Since the game's focus is on blazing ninja action, fighting is usually the better option in those cases. They have tutorials in the beginning, and they help. They tell you the basics of attacking and how to parry, which is pretty much mandatory to kill the stronger enemies. That's on normal difficulty, too. You'll want to master it as soon as you can, since it makes the fights a lot easier...and look a whole lot cooler. One thing that will help a lot is knowing when to parry. Most games, you guard right before the attack hits you. 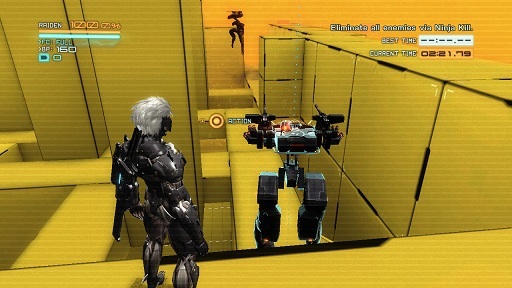 In Metal Gear Rising, you have to actually attack to parry, so you have to start it earlier than you might be used to. Once I realized this, it became easier. Not as easy as it is in other action games, but it works fairly well. However, it's annoying that parrying some attacks does not actually stop the attack or give you a counter, meaning you have to somehow dodge it. I really wish there was a proper dodge move, as it would make the combat much easier. You can use the points acquired to buy new combo moves and various upgrades. They are pretty self-explanatory, so no confusion with what I was buying. I want the moves to tell you how to perform them when you purchase them, or at least on the description of the attack. As it is, you have to pause the game (outside of the upgrade screen) and check the help option to see your moves. It's pretty cumbersome and I didn't figure that out for a bit. The moves you buy are pretty cool, but didn't feel as important to me as buying more attack power, energy and health. My favorite thing to buy has to be the mariachi costume from one of the funny scenes in the game. Yes, there was actually some humor in the game, which I liked and did not expect. The best part of the combat system is blade mode. If you have enough energy, you can enter blade mode, which slows down time and allows you to precisely aim your slashes. If you played Afro Samurai, this may sound familiar. It's ridiculously awesome to start slashing and see all the tiny pieces fall apart in slow-mo. It's fun and practical. I say practical because if you slice enemies in certain places after they are weakened, you can grab their power core and it restores your health. It also looks cool, since he shatters it in his hand. There is some in-game justification for it, but who cares when it looks cool? When enemies take enough damage, their limbs or parts of their body will glow blue, and can be easily removed in blade mode. This really helps on the tougher guys, as it can cripple their offense. Other times there will be a button prompt on screen that can lead you into a great blade mode opportunity to finish the enemy off. Once you get used to it all, you feel like a true badass destroying enemies of all sizes. The difficulty can be pretty uneven at times. The normal troops can get in a few hits, but provide little challenge. Most larger enemies have a lot more health and seem to shrug off most things you can throw at it. They can be stunned by amassing several hits, but it can be really hard to hit it enough before it starts laying into you. Parrying them is near mandatory, but it can be really tricky to do it on multi-hit attacks or projectiles, often resulting in a loss of health for me. Sometimes it was me missing the timing, and sometimes it was the game giving me a horrible camera angle so I couldn't see the attack to attempt to parry it. Also, if you get swarmed, it can be very hard to fight your way out. Thankfully, if you can cut the critical point on an enemy, you can grab its nano paste and restore your health, which helps a lot more than you might think. I could muddle through most fights without suffering critical damage, but some of the mini-bosses would punish the snot out of me. The robot dog (that you fight at the end of the demo) destroyed me several times before I got the hang of fighting it and figured out what to do. A few of the other mini-bosses were fairly tough and did chunks of damage. However, one of the main bosses was dispatched in my first fight with it (I won't say what so I don't accidentally spoil anything). It struck me as odd that the any of the mini-bosses would take more time to beat than one of the main bosses, so I felt there was some unevenness to the difficulty. Of course, fighting the camera also made some fights much harder than they had to be. Locking on helped when it was a mini-boss or solo enemy, but that doesn't help when fighting multiple guys. People could sneak up on you while you were trying to rotate the camera, and if you were near a wall, your best option was to take the damage and run away from it. I still feel that a dodge roll would have helped a lot. You can stealth kill even the Gekkos. Awesome. There's a fair amount of collectibles, and it's interesting that not all of them are "go find a box". Yes, there are many that are just hidden around the environment and need to be located, but some are retrieved from the left hand of certain enemies. I was really bad at getting these, often resulting in restarting checkpoints or replaying levels specifically to hunt them down. The ones in boxes (sometimes cardboard boxes, hahaha) were fairly easy to locate, but I know I missed some of them. Also, some are special metal boxes that I couldn't cut open and left them. On the third one of them I encountered, I tried blade mode and it cut it open. I was pretty annoyed, since I had already passed two and couldn't get them to open. Good thing I was going to go through the level again to get other things, I guess. Looking around in the game's AR mode makes it easier to see the various boxes and who's ID you can acquire from their hand. A handy tool indeed. If you like to get trophies or achievements, take a look at the list before you start a stage. There is the standard "beat x stage" ones, but also each stage contains at least one extra one for doing something unique in it. I missed the first one by a few minutes because I didn't check first. No big deal, but something to watch out for. Getting the best rank on the hardest difficulty and the best times in all the VR missions (yes, they make a return, so don't tell my wife) will be true tests of skill. I know I'm not going to get them, but it is something to shoot for. One last note I want to make on Metal Gear Rising-- the loading. There isn't very much, which mystifies me. The game looks gorgeous, but only has loading when switching menus or reloading a checkpoint. The game transitions right into cut scenes from gameplay with a quick fade out. I admit that I was a little worried about this game. I'm not a huge fan of the Metal Gear Solid series (I do love the first one, though), and wasn't sure how this would fit with it into the whole Metal Gear continuity. I thought it might end up as an action game that just had the Metal Gear name slapped onto it to increase sales, but I don't think that after playing it. It's a really fun game (even if I hate the camera at times) and I think the backdrop of the Metal Gear world ties in pretty well, so it feels like an extension of that world, not just a name on the box. If you like over the top action games, or slicing robots into tons of tiny pieces, give Metal Gear Rising: Revengeance a chance. It's an action game made by Platinum Games, and it shows in every flashy kill. It's gorgeous and fun, even with the frustration some fights would bring.